It is time to be completely honest, my style mavens. The past few months have left me contemplating the state of my blog and what my next move should be. You see, although I love being a blogger (most days), I have a full time marketing job that I love, a fashion column for a new magazine, and a social life that I am determined to maintain, rather than sitting at home stressing over editing photos. So, because there are only so many hours in the day, I have been putting my blog to the side by only posting an entry or two a week. Well, that is about to change. Instead of stressing over getting that perfect shot every time I post and if the weather is going to be nice enough to head downtown to shoot an outfit, I am going to start posting some Blogger Off Duty style, because what I wear during the time I am not blogging is just as important, if not more so, than what I am wearing when there is a nice camera and lens involved. In other words, I want to bring you readers more content and also be more realistic with what I putting up on The Chic Street. Absolutely! Love your new category, Miranda! To be “back to the roots” of “realistic” bloogging aka Blogger Off Duty style is a really good decision!!! Miss Alt is such a style icon, so thanks!!! Looking beautiful. I love your chambray! Yay! I’d love to see more posts like this 🙂 Because yes, I like seeing what people wear in their day-to-day life, not just for blog photos. Love the dressed down outfit Miranda. Oh – how I would love to see other’s bloggers “blogger off duty” looks haha. I’m glad my style is pretty much the same across blog pots + real life, as I think yours is as well – but we all know that some of these guys just get dressed up for blog shoots. That is a great idea, and I wish I looked so good as a “blogger off duty.” Instead, this morning I was blogging in Eeyore PJ’s until my doorbell rang around 10 *shame* Love the look! 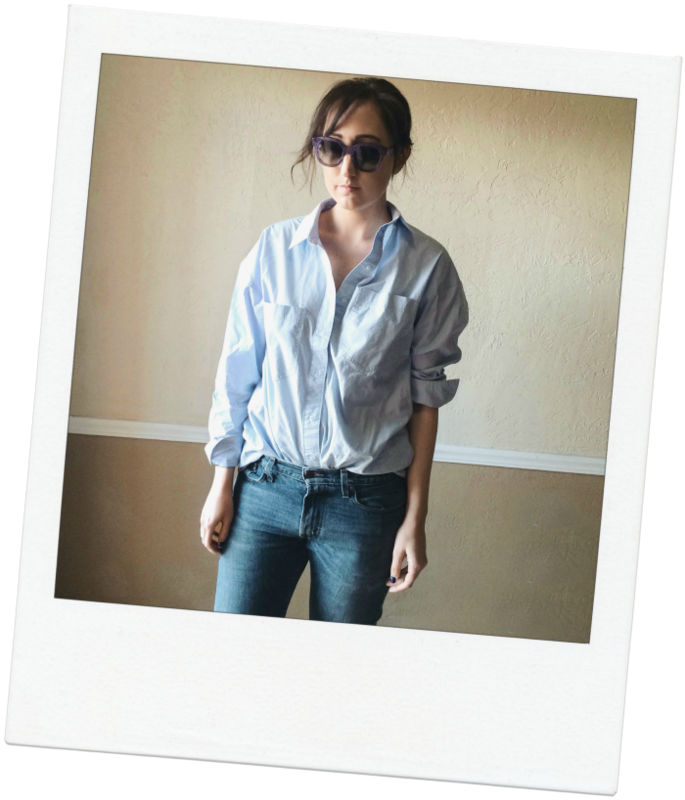 I love this denim look… very casual and chic!